Salmon, Idaho: Several fires were reported due to the thunderstorms that passed over the Salmon-Challis National Forest (SCF) Friday, July 1, in the afternoon. A Red Flag warning is in effect today from 1 pm this afternoon to 9 pm this evening for strong gusty winds, up to 40 miles per hour and low humidity. Salmon-Challis National Forest fire danger is HIGH. 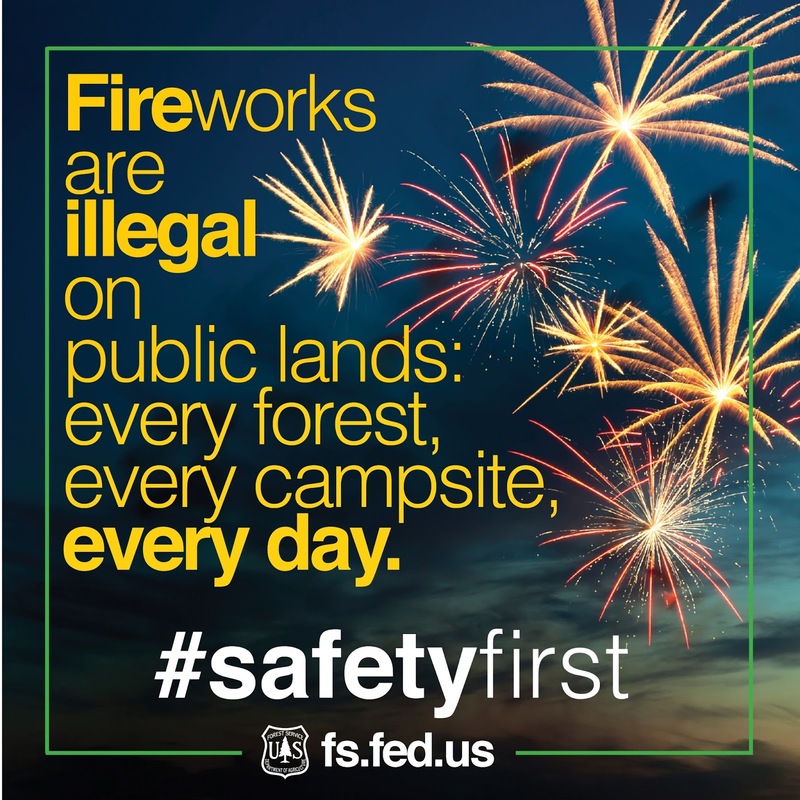 Safety first- fireworks are prohibited on all National Forests year-round. 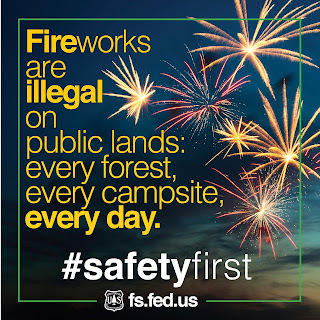 No fireworks of any kind may be discharged anywhere within the Salmon-Challis National Forest, regardless of weather conditions or holidays. Make sure your campfire is dead out. If it’s too hot to touch, it’s too hot to leave. Staffing: Six (6) smokejumpers, two 20 person crews. The fire is receiving support from two Type I Helicopters. Access to this fire is limited. Fire size: 10 acres with 15% containment. Fuels are subalpine fir and lodgepole pine with many dead and down trees. Fire size has decreased due to more accurate mapping. Location: Southwest of Golden Trout Lake, within and outside of the Frank Church River of No Return Wilderness. Staffing: 16 smokejumpers, two Type I crews, a Type II crew, and two Type I Helicopters. Two additional crews are in route and will be assigned to the fire. Access to this fire is limited. Fire size: 30 acres with 25% containment. Fuels are subalpine fir and whitebark pine and many dead and down trees. Fire size: 15-20 acres with scattered fuels. Fire is burning mid-slope and no smoke was observed yesterday. Fire is lightning caused, and will continue to be permitted to play, as nearly as possible, its natural ecological role in the wilderness. Currently, there are multiple crews, helicopters, and associated support staff in the community of Salmon. These resources are supporting the 3 Mile, Golden Trout fires, and any new fires the Forest may get. You may see these resources at your local stores, hotels, and restaurants. Leave No Trace- Pack it in, Pack it out. It is your responsibility to pack out everything that you packed in, including any trash. You are welcome to visit the Salmon-Challis National Forest website: http://www.fs.usda.gov/main/scnf/home, and check out News & Events, ‘Like Us’ on https://www.facebook.com/salmonchallisnf, and ‘Follow Us’ on https://twitter.com/SalmonChallisNF for further information.